The decision of national Norwegian TV to showcase the women's event paid off with a dramatic showdown between the big favorites, China and Russia. Russia's new number one, Kateryna Lagno, brutally upset women's world number two Yifan Hou. 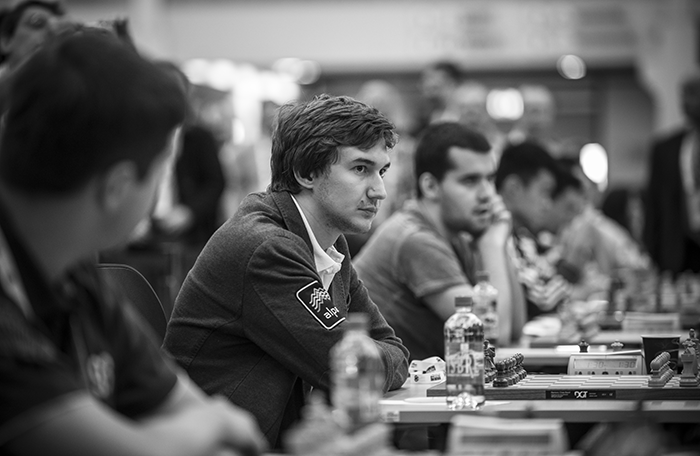 Elsewhere the Russian men lost, as did Norway, after Magnus Carlsen was downed by Arkadij Naiditsch. 8. dxc5 The text is quite logical, though, as Bg2 will put d5 under pressure. 11... ♗a6 was clearly preferable. 12. ♘b5 ♗c6? Now things go from bad to worse. 13. ♘c7 White is winning material by force. 13... ♖c8 14. a3 ♗a5 15. b4 ♘e4 16. dxc5 bxc5 17. bxa5 ♖xc7 18. ♗xc7 ♕xc7 19. ♘d2 f5 20. ♖ac1 ♔h8 21. f3 ♘xd2 22. ♕xd2 f4 23. gxf4 ♖xf4 24. e3 ♖a4 25. f4 ♕xa5 26. ♖fd1 ♘b6 27. ♕b2 ♖xa3 28. f5 ♖a2 29. ♕e5 ♕b4 30. e4 ♘c4 31. ♕c3 ♕b7 The grim alternative was a lost ending. 37... ♗xg8 38. ♖d7+ ♔g6 39. ♖g7+ with a quick mate to follow. 38. ♖d8+ ♔h7 39. ♖h8+ ♔g6 40. ♕g3+ Black resigned. With China under pressure on board four as well, it looked as if the fate of the gold medals could already be decided today, and WGM Olga Girya sealed a 3-1 win for Russia with a victory on the bottom table against WGM Zhongyi Tan. In the previous Olympiad Russia edged out China on tiebreak, both teams scoring 19 match points, but the 2010 Olympiad in Khanty-Mansiysk showed the kind of performance that might be required for gold, with Russia posting a perfect 22 over the 11 rounds. Dresden 2008 was full of shock results, and ended with Georgia taking the gold from Ukraine on tiebreak, both scoring 'just' 18 match points. Azerbaijan struck back to level the top Open match, winning on board four against Cuba to neutralize Dominguez' flashy win over Mamedyarov on board two. 25... ♗e7 looked like Black's best try. After the text move White's attack quickly becomes overwhelming. 26. exd5 ♗xa4 27. dxe6! fxe6 28. bxa4 ♘d5 29. ♘c6+! White puts an end to the proceedings with a couple of brutal blows. 31... ♘c3+ 32. ♔a1 ♕xg5 33. ♖f6+ ♔g7 34. ♕f7+ ♔h8 35. ♖h1+ and Black gets mated. Azerbaijan then snatched both match points and moved into sole first by winning on board two, with Teimour Radjabov beating Lazaro Bruzon Batista in a deceptively tricky rook ending. Even more dramatic were developments on the second table, where top seeds Russia were facing the 16th ranked Czech Republic. 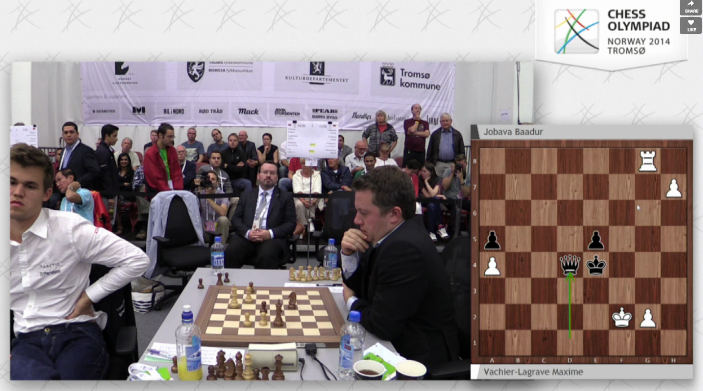 Disaster loomed for the favorites after David Navara toppled Alexander Grischuk in energetic fashion on board one. 31. gxf7+ After massive exchanges White obtains a winning endgame. Viktor Laznicka guaranteed the Czechs at least a draw by downing Peter Svidler with black to sweep the top boards. When Czech GM Zbynek Hracek liquidated to a draw against Sergey Karjakin, the match was secured for the underdogs, who closed out with another draw to make it 3-1. Russia has now dropped four match points. Checking the statistics of the last three Olympiads, which share the 11-round format, the winner has never scored less than 19/22 match points - in Istanbul 2012 Armenia and Russia reached this total, and Armenia won on tie-break - in Khanty-Mansiysk only the Ukraine scored 19, and in Dresden 2008, only Armenia. Although there are signs that Tromsø could be an unusually even Olympiad, the pressure on the top seeds must now be immense, with 18 match points now being their maximum possible score. The next sensation was the shaky collapse of World Champion Magnus Carlsen. Locals were glued to their TV sets in confused horror as their hero, playing White against German first board Arkadij Naiditsch, began gradually turning a clear advantage into a situation of real danger. The Norwegian's normally fearsome technique was absent, and it was clear at the end of the first session that he would need all his vaunted technical skills to avoid defeat. All the other games in the match were drawn, and Naiditsch clinched the match for Germany. 15... ♗xb4 16. axb4 ♕xa1 17. ♗b2 ♕a2 18. ♘d2 ♘xb4 19. ♕c3 e5 20. ♖a1 ♕e6 21. ♕xb4 ♗xe2 22. ♖e1 a5 23. ♕c3 ♗b5 24. ♖xe5 leaves White with a clear edge. Black is doing OK in terms of material, but White's pieces are extremely active. 18... ♗xc5 19. bxc5 ♕xc5 didn't look like much fun for Black as White's pair of bishops would give him a long-term advantage. 19... ♘c3 20. ♕xc4 ♗xc4 21. ♗xa8 ♖xa8 22. ♗b2 ♘xe2+ 23. ♖xe2 ♗xe2 24. ♗xf6 gxf6 certainly looks better for Black than the game continuation. 23... ♘e2+ 24. ♔h1 ♘d4 25. ♖ac1 ♗d5 26. ♗xd5 exd5 This pawn might look weak, but Black manages to create an amazing amount of counterplay with it. 27. ♘d7 ♖xc1 28. ♖xc1 ♖d8 29. ♘c5 ♗xc5 30. ♖xc5 ♘f3 "Now the position is quite tricky", Naiditsch told Jan Gustafsson and Lawrence Trent in the chess24 studio after the game. 31. ♗c3 g5! Is it possible that Carlsen missed this? Now the knight becomes a permanent thorn in White's side. 32. h3 h5 33. ♔g2 g4 34. b5 ♖d7 35. ♖c8+ ♔h7 36. ♗a5 d4 37. hxg4 hxg4 38. e6? At this stage Carlsen was in serious trouble on the clock. 38. ♖c7 ♖xc7 39. ♗xc7 d3 40. ♔f1 ♘d4 41. ♔e1 ♘xb5 42. ♗d6 ♔g6 43. ♔d2 ♔f5 44. ♔xd3 ♔e6 45. ♗b4 ♔xe5 46. a4 and a draw seems more than likely. 44. ♗xa7 ♘c4 45. ♗c5 ♔g6 46. ♗b4 ♔f5 47. ♗c5 ♔e4 48. ♗b4 ♔f3 49. ♗c5 e5 50. ♗a7 e4 51. ♗d4 e3 52. fxe3 ♔xg3 leads to a trivial win for Black. 52. ♔xe5 gxf3 and one of the black pawns will queen. 52... ♔g5 53. fxg4 e4 54. ♔d2 ♘b5 55. ♗e5 ♔xg4 56. ♔e3 ♔f5 57. ♗a1 ♘d6 58. ♔d2 ♔g4 59. ♔e3 a2 60. ♗c3 ♔xg3 61. ♗a1 ♔g4 62. ♔d2 ♔f3 63. ♔e1 e3 64. ♔f1 e2+ 65. ♔e1 ♘e4 66. ♗b2 ♘c5 67. ♔d2 ♔f2 68. ♗d4+ ♔f1 and the e-pawn queens. He started to panic. It was a little bit strange to see him so nervous... I have been as lucky as Magnus Carlsen usually is. 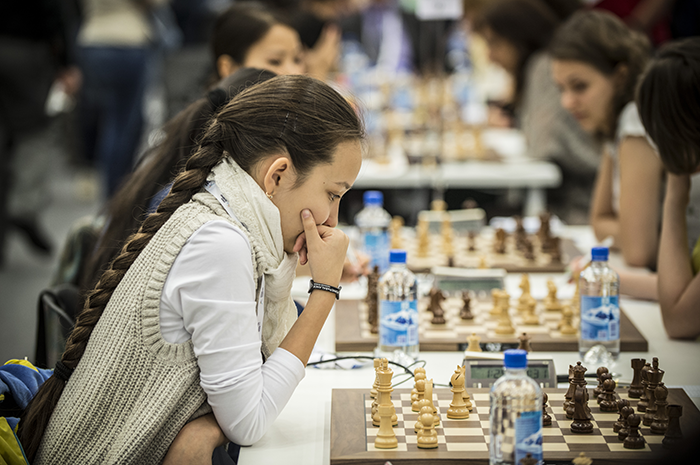 How eventful was the 7th round of the Chess Olympiad? Well, how often do both top seeded teams, and both world champions lose on the same day? China's disappointment in the Women's event was avenged in full in the Open, with China adding a third win to complete a 3.5-0.5 mauling of Serbia. Bulgaria continue to fight at the top, beating the Netherlands 3-1, with their hot man Valentin Iotov running his score up to 6.5/7 by beating Sergei Tiviakov, and GM Krasimir Rusev downing Loek van Wely. 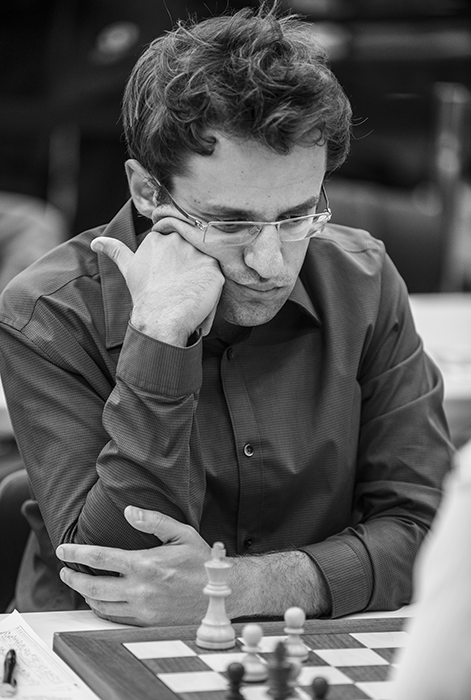 Defending champions Armenia dropped another match point, this one to Hungary, despite Levon Aronian's win over the usually indestructible Peter Leko. Csaba Bologh evened things up by beating Gabriel Sargissian and the other boards were drawn. Third seeds France took the up elevator, beating Georgia 3-1, boosted by a successful grinding win in a Q+a-pawn vs Q ending by Vachier-Lagrave over Baadur Jobava. The 6th seeded USA began what could be a fight back to the top of the table - with GM Sam Shankland running up his score to 6/6 on fourth board, and with leader and world number five Hikaru Nakamura doubling their early lead over Uzbekistan by beating Rustam Kasimdzhanov. Down on table 12, Ukraine belatedly showed their strength by overrunning Kazakhstan by the same score. The other top matches in the Women's section were grimly even. Poland-France, Armenia-USA, and Indonesia-Iran all ended in 2-2 deadlocks. The rest of the top seeds posted results that should return them to the thick of the fray: 3rd seed Ukraine and 4th seed Georgia won 3-1, against Kazakhstan and Serbia, respectively, and now meet in Round 7. The organizers have now issued a press release regarding the regularly absent players from Burundi - their women's team, and second board for their Open team, Tony Nininahazwe - face exclusion from the event. Norwegian newspaper VG reported that the location of the players is unknown, and that a security group from the organization were discussing the case. The organizers said that a follow-up press conference would be convened if they learned anything more.